Intrepid writer and amateur sleuth Josephine Tey returns in this sixth installment of Nicola Upson’s popular series—perfect for fans of Agatha Christie’s Hercule Poirot and Jaqueline Winspear’s Maisie Dobbs—that unfolds in 1930s London as England prepares to crown a new king. London, 1937. Following the gloomy days of the abdication of King Edward VIII, the entire city is elated to welcome King George. Just one of the many planned festivities for the historic coronation is a BBC radio adaptation of Queen of Scots, and the original playwright, Josephine Tey, has been invited to sit in on rehearsals. Soon, however, Josephine gets wrapped up in another sort of drama. The lead actress has been sleeping with Britain’s most venerable newsman, Anthony Beresford—and his humiliated wife happens to work in the building. The sordid affair seems to reach its bloody climax when Beresford is shot to death in his broadcasting booth at the deafening height of the coronation ceremony. Josephine’s friend Detective Chief Inspector Archie Penrose thinks he has the case wrapped up. But after two more murders, it falls to Josephine to unravel a web of betrayal, jealousy, and long-held secrets, as she herself is caught in a love triangle of her own. 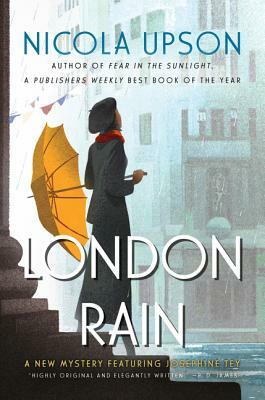 Charming and provocative, thick with the atmosphere of prewar England, London Rain is a captivating portrait of a city on the edge—and an unforgettable woman always one step ahead of her time. Nicola Upson is the author of five previous Josephine Tey mysteries, including An Expert in Murder, and two works of nonfiction. She has worked in theater and as a freelance journalist. A recipient of an Escalator Award from the Arts Council England, she splits her time between Cambridge and Cornwall.